Korea Travel Expo 2019 – Foreign Guests’ Day! Learn everything about local trips in Korea! 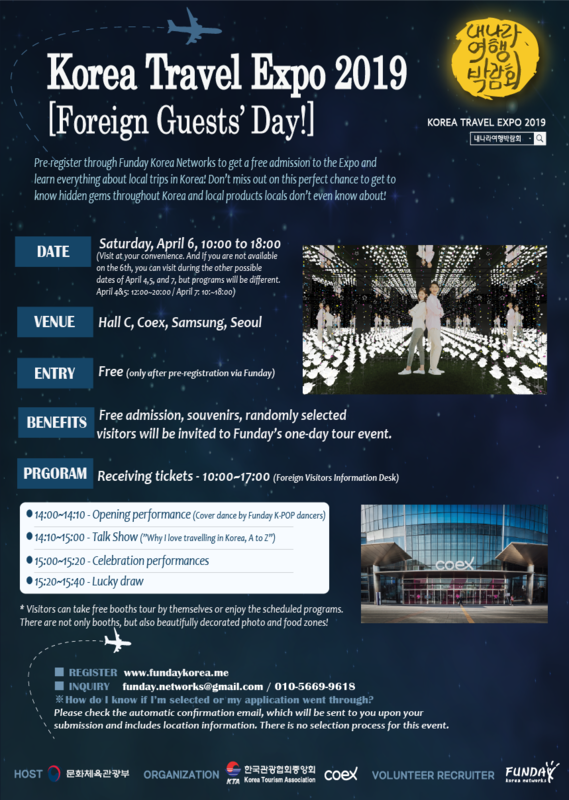 You are invited to the Korea Travel Expo 2019 on Saturday, April 6 which is “Foreign Guests Day!”, featuring this year’s theme, “When was your best overnight trip?”, where you can enjoy beautifully decorated night-themed photo zones and night food booths! ■ 혜택: BENEFITS: Free admission, souvenirs, randomly selected visitors will be invited to Funday’s one-day tour event. ■ REGISTRATION: www.fundaykorea.me / Until Monday, April 1st. ※ How do I know if I am selected or my application went through. There is no selection process, which means pre-registered participants will be welcome to come. Please check the automatic confirmation email, which will be sent to you upon your submission and includes location information. 한국 여행에 대한 모든 것! 내나라여행박람회 ‘외국인의 날’에 여러분을 무료로 초대합니다. 특별히 올해에는 ‘인생야행’ 이라는 주제와 함께 예쁜 포토존, 야식 푸드부스도 입점이 되어 있습니다. 로컬들도 모르는 전국의 숨은 여행지, 특산품 등, 신나는 박람회에 펀데이를 통해 사전 신청하시고 무료로 입장하세요! ※ 선발이 되었는지 어떻게 알 수 있나요? 신청을 하신 후 발송되는 자동 컨펌 이메일을 확인해주세요.